As a high school student (I won’t get into how long ago that was now), I used to help my best friend do the yardwork for his grandparents every other week. Once we got into a routine it was actually pretty easy, but that first time was an absolute nightmare. His grandfather had recently suffered some health setbacks and hadn’t been able to take care of the outside chores for a while before we stepped in. Weeds were overgrown all along the fence – some of them looked like small trees! We were able to clean it all up, but not without a lot of effort. Unfortunately, he didn’t have any power tools. What we wouldn’t have given for a chainsaw! From that day forward I vowed to always have the right tools for the job. There are a lot of different choices these days when it comes to chainsaws and that includes the WORX WG308 6-Inch 5-Amp Electric JawSaw. This is quite an interesting looking tool with a set of jaws set on the end of the pole, but that doesn’t mean it isn’t effective for cutting branches. This is an electric model and it’s affordable as well, at well under $200. The fact that this saw is electric also means that it’s environmentally friendly. You can trim and prune those branches, firm in the knowledge that you aren’t contributing any carbon emissions into the air around you. There’s something to be said for the peace of mind you feel when you’re doing even a little bit extra to help keep pollution at bay. This saw is not meant for cutting down trees. It’s strictly a tool for trimming small branches and tackling runaway weeds. The blade bar is only 6 inches and, just to put things in perspective, there are a number of chainsaws on the market with 24-inch bars or more – that’s quite a large difference. If you’re looking for a saw that can chop through large logs for a nice big open air fire, you should probably keep looking. The big advantage of this jawsaw is without a doubt its extendable pole. You don’t have to run for the ladder every time you have a tall branch to reach. The bar is extendable up to 12 feet, but you can also shorten it up if you don’t need all of that extra reach. Its convenience and versatility are definitely two of its biggest selling features. The other great benefit of an electric saw is that you don’t have to put up with a lot of unwanted noise. A gas-powered chainsaw is much louder because of its internal combustion engine – all you’ll notice with this electric saw is a bit of a buzz as you work. Your ears will definitely thank you and your family and neighbors will as well! If you plan on putting your new WORX WG308 jawsaw through a lot of regular work it won’t take long for the tension on the saw’s jaws to work loose and that is something you’ll want to avoid. A loose chain on any type of chainsaw is going to make cutting through wood a lot more difficult. That’s why this saw includes a simple single bolt auto tension system that allows you to adjust the tension on your chain in a couple of seconds and get right back to cutting. If you’re going to use a saw on the end of a pole it has to be light enough that you can handle it with relative ease. If it isn’t, your shoulders and forearms will feel like they’re burning in no time. This Worx saw weighs in at about 14 pounds, which is manageable although it will certainly have its effect after prolonged use. There are electric models that weigh less than 10 pounds and if you have any kind of physical limitations you may want to look at something that’s even lighter. Starting a gas-powered chainsaw can be a frustrating experience. It often takes two or three pulls to get the machine started and you might be feeling the strain in your shoulders before you even cut your first log. With an electric saw such as the WG308 you don’t have to worry about wearing your shoulders out pulling on a cord. This saw starts with a push of a button and it starts on the first push just about every time. One thing this type of saw does much better than traditional chainsaws is focus on safety. The jaw cutting design completely encloses the chainsaw and reduces the odds of accidents. Your fingers will be a lot safer, and there is very little kickback so other types of injuries are much less likely as well. The extra peace of mind that comes from knowing that there’s minimal chance of injury can’t be overstated. There have been two consistent criticisms of this saw – it’s simply too heavy for a saw on the end of a pole, and the chain comes loose far too often. We touched upon the weight being a little bit more than might be comfortable earlier and it seems there are quite a few critics that agree with this assessment. When you couple that with the fact that the chain does have a reputation for coming loose from time to time there’s definitely some cause for concern. 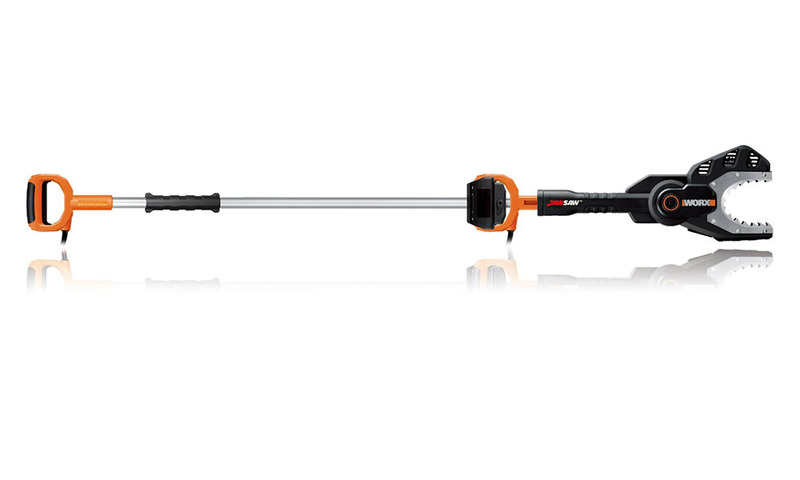 The WORX WG308 6-Inch 5-Amp Electric JawSaw has a lot of real benefits that shouldn’t be overlooked despite a couple of deficiencies. The chain is a bit of a concern, but with the available automatic tension feature this shouldn’t be a major issue. The bigger question is the weight and that comes down to how much weight you feel comfortable handling.